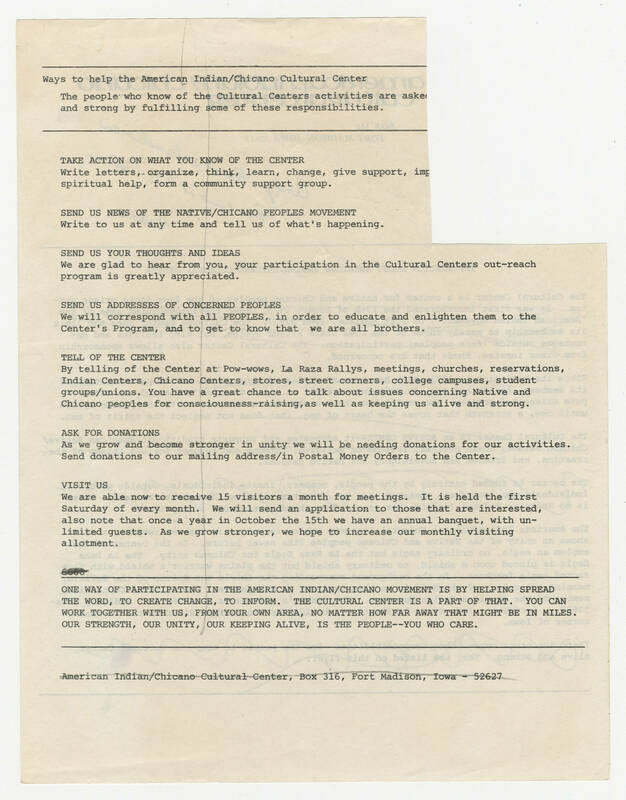 Ways to help the American Indian/Chicano Cultural Center The people who know of the Cultural Centers activities are asked ... and strong by fulfilling some of these responsibilities. TAKE ACTION ON WHAT YOU KNOW OF THE CENTER Write letters, organize, think, learn, change, give support, imp... spiritual help, form a community support group. SEND US NEWS OF THE NATIVE/CHICANO PEOPLES MOVEMENT Write to us at any time and tell us of what's happening. SEND US ADDRESSES OF CONCERNED PEOPLES We will correspond with all PEOPLES, in order to educate an enlighten them to the Center's Program, and to get to know that we are all brothers. TELL OF THE CENTER By telling of the Center at Pow-wows, La Raza Rallys, meetings, churches, reservations, Indian Centers, Chicano Centers, stores, street corners, college campuses, student groups/unions. You have a great chance to talk about issues concerning Native and Chicano peoples for consciousness-raising, as well as keeping us alive and strong. ASK FOR DONATIONS As we grow and become stronger in unity we will be needing donations for our activities. Send donations to our mailing address/in Postal Money Orders to the Center. VISIT US We are able now to receive 15 visitors a month for meetings. it is held the first Saturday of every month. We will send an application to those that are interested, also note that once a year in October the 15th we have an annual banquet, with unlimited guests. As we grow stronger, we hope to increase our monthly visiting allotment. ONE WAY OF PARTICIPATING IN THE AMERICAN INDIAN/CHICANO MOVEMENT IS BY HELPING SPREAD THE WORD, TO CREATE CHANGE, TO INFORM. THE CULTURAL CENTER IS A PART OF THAT. YOU CAN WORK TOGETHER WITH US, FROM YOUR OWN AREA, NO MATTER HOW FAR AWAY THAT MIGHT BE IN MILES. OUR STRENGTH, OUR UNITY, OUR KEEPING ALIVE, IS THE PEOPLE--YOU WHO CARE.